VideForex ( BinaryMate ) , launched in 2016, is a new generation binary options broker on the market. It’s a new revolutionary propietary trading platform including a live video chat with managers 24/7 . BinaryMate is not longer available to international and US Traders. Please visit VideForex instead. Their payout system is really astonishing. You can get up to 95% return in 60 seconds on over 100 assets to trade. And best of all they are accepting Bitcoin as deposit method. During our research and test, we were very impressed with the fact that its fully developed on-house trading platform is very easy to use for both beginner traders or professionals. It’s available on desktop and mobile Apps ( Android and iPhone ). its trading platform possesses the highest security level ( 10 point out of 10-point grading scale ), simple user-friendly interface and is extremely convenient especially for active style of trading. There are 3 type of accounts available ( Bronze, Silver and Gold ) according to your deposit. Demo accounts are awarded to all customers who deposit upon request to its customer service. 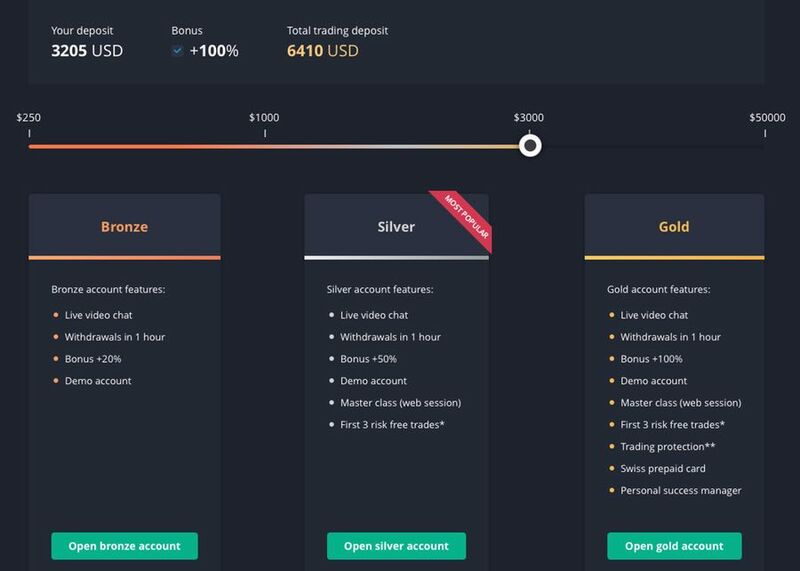 Bronze account only have a minimum deposit requirement of only $250, so it’s perfect for beginner traders, however for advanced traders we recommend a deposit of over $3000 and get a huge 100% Bonus ( check bonus requirements on their website ). They offer a wire variety of assets to trade including commodities, stocks, indices and the most popular currencies pairs like EUR/USD, GBP/EUR or USD/CAD. Binary Mate offers up to 100% Deposit Bonus + Free Risk Trades to all traders. All binary mate traders are automatically registered for FREE in their trading contest . They are giving away $20,000 in prizes with 20 winners every week. Learn more about their binary mate trading contest. BinaryMate have of the highest payouts in the binary options industry. You can get up to 95% Payout on standard options. They offer 1-hour withdrawals and multiple deposit methods including credit cards, bank transfer, Skrill, Bitcoin, Neteller, OKPAY, Alipay, Perfect Money and Qiwi. BinaryMate.com is the first binary options platform to provide 24/7 live video chat support to its customers. Beautiful ladies ( account managers ) are dedicated to answer all potential queries, and help you to get the best returns of your investment. Furthermore also they have customer service through phone, email and callback. Currently BinaryMate.com is NOT accepting US Traders. They provide the most advanced binary options trading platform, with 24/7 live beautiful managers to help you achieve the best results in your investment. BinaryMate gives traders ability to trade manually or with the help of 3d party robots and trading assistants. Others pros such a minimum deposit of just $250, 1-hour withdrawal, free education and high payouts make BinaryMate the best choice among binary options brokers. Great trading platform, and highly responsive customer support. Ella answered quickly all my questions though video chat. I finally found a trusted broker, not a scam. To Santa and Valerie ( customer support staff ) "I am writing this comment to thank you for all the support that you have extended to me during all my time in BinaryMate.com "
Great platform for first timers like me. Their customer support is always online to provide help. I have invested 1,500$ with Nadia from BinaryMate, in several contracts, and this lady has help me to DOUBLE my investment in NO TIME through video chat. I am very pleased with the people at BinaryMate and highly recommend ! I've had several problems with the website, something about my browser, I did not fully understand it. Their customer service was top notch ( amazing live video chat ) and really helped me out!